馬場 柾也, 和田 侑大, 桑原 和宏: 単語想起支援システムにおけるインターネットを利用したデータ拡充手法, 電子情報通信学会2019年総合大会情報・システムソサイエティ特別企画「学生ポスターセッション」, ISS-P-043 (2019). Fukuda, M., Huang, H.H., Kuwabara, K., and Nishida, T.: Proposal of a Multi-purpose and Modular Virtual Classroom Framework for Teacher Training, Proceedings of the 18th International Conference on Intelligent Virtual Agents (IVA 2018), pp. 355-356 (2018). Huang, H.H., Zhang, Q., Okada, S., Kuwabara, K., and Nishida, T.: Adopting Functional Roles for Improving Participants Communication Skill in Group Discussion Conversation, Workshop on Group Interaction Frontiers in Technology (GIFT 2018), 20th ACM International Conference on Multimodal Interaction (ICMI 2018) (2018). 木村 清也, 黄 宏軒, 桑原 和宏: グループディスカッション参加ロボットの頭部動作決定機構の検討, 第32回人工知能学会全国大会, 3C2-OS-14b-03 (2018). 福田 匡人, 黄 宏軒, 桑原 和宏: 仮想学級の雰囲気表現を用いた教員志望者の指導訓練環境の検討, 第32回人工知能学会全国大会, 1L2-01 (2018). 荒谷 優也, Gohourou Didier, 桑原 和宏, 黄 宏軒: 単語ベクトルを用いた企業間類似度の時間的遷移の検出, 電子情報通信学会2018年総合大会情報・システムソサイエティ特別企画「学生ポスターセッション」, ISS-A-053 (2018). 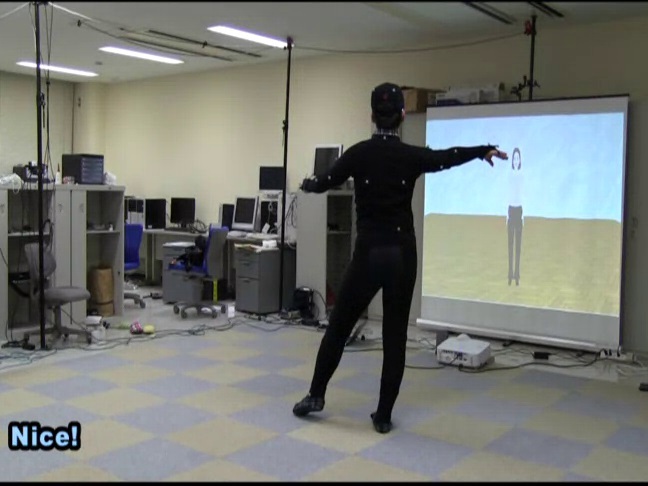 Fukuda, M., Huang, H.H., Ohta, N., and Kuwabara, K.: Proposal of a Parameterized Atmosphere Generation Model in a Virtual Classroom, 5th International Conference on Human-Agent Interaction (HAI 2017) (2017). Kimura, S., Huang, H.H., Zhang, Q., Okada, S., Ohta, N., and Kuwabara, K.: Proposal of a Model to Determine the Attention Target for an Agent in Group Discussion with Non-verbal Features, 5th International Conference on Human-Agent Interaction (HAI 2017) (2017). Zhang, Q., Huang, H.H., Kimura, S., Okada, S., Hayashi, Y., Takase, Y., Nakano, Y., Ohta, N., and Kuwabara, K.: Toward a Supporting System of Communication Skill: The Influence of Functional Roles of Participants in Group Discussion, 9th International Conference on Social Computing and Social Media (SCSM 2017) Held as Part of HCI International 2017, LNCS 10283, pp. 178-188 (2017). Gohourou, D., Kurita, D., Kuwabara, K., and Huang, H.H. : International Business Matching Using Word Embedding, 9th Asian Conference on Intelligent Information and Database Systems (ACIIDS 2017), Part I, LNAI 10191, pp. 181-190 (2017). Iwamae, T., Kuwabara, K., and Huang, H.H. : Toward Gamified Knowledge Contents Refinement - Case Study of a Conversation Partner Agent, 9th International Conference on Agents and Artificial Intelligence (ICAART 2017) - Volume 1, pp. 302-307 (2017). 木村 清也, 黄 宏軒, 岡田 将吾, 大田 直樹, 桑原 和宏: グループディスカッションに参加するロボットのための頭部動作モデルの検討, HAIシンポジウム2017 (2017). 淀川 大, 木下 遼祐, 黄 宏軒, 大田 直樹, 桑原 和宏: 仮想学級システムに向けての自動評価基準の検討, 信学技報, vol. 117, no. 177, HCS2017-54, pp. 41-45 (2017). 木村 清也, 張 琪, 黄 宏軒, 岡田 将吾, 林 佑樹, 高瀬 裕, 中野 有紀子, 大田 直樹, 桑原 和宏: グループディスカッションに参加するロボットにおけるアテンション対象モデルの提案, 第31回人工知能学会全国大会, 2G1-3 (2017). 張 琪, 木村 清也, 黄 宏軒, 岡田 将吾, 林 佑樹, 高瀬 裕, 中野 有紀子, 桑原 和宏: グループディスカッション参加者の役割に基づいた会話状況とコミュニケーション能力の分析, 第31回人工知能学会全国大会, 2H4-OS-35b-2 (2017). 栗田 大貴, 桑原 和宏, 黄 宏軒: ゲーミフィケーションを用いた知識コンテンツの洗練手法の提案, 電子情報通信学会2017年総合大会情報・システムソサイエティ特別企画「学生ポスターセッション」, ISS-P-110 (2017). 和田 侑大, 岩前 貴之, 桑原 和宏, 黄 宏軒, 竹中 啓介: 失語のある人を対象にした単語想起システムにおけるデータベースの拡充, 電子情報通信学会2017年総合大会情報・システムソサイエティ特別企画「学生ポスターセッション」, ISS-P-142 (2017). 福田 匡人, 黄 宏軒, 桑原 和宏, 大田 直樹: 教員志願者の練習システムにおける仮想学級の雰囲気モデルの提案, 信学技報, vol. 116, no. 436, HCS2016-65, pp. 35-39 (2017). 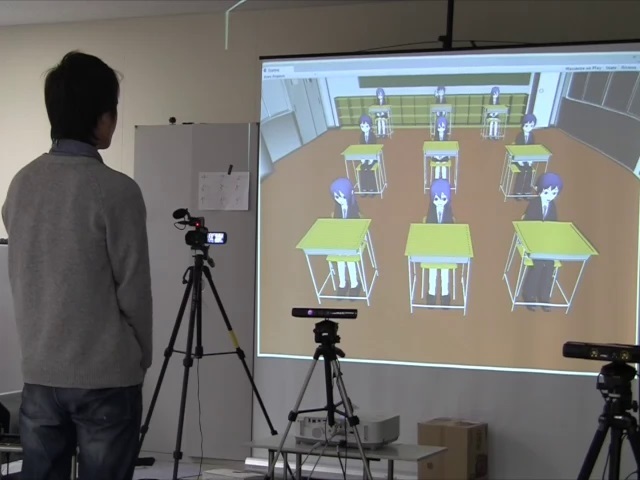 Fukuda, M., Huang, H.H., Kanno, T., Ohta, N., and Kuwabara, K.: Development of a Simulated Environment for the Recruiting Examination and Training of High School Teachers, 4th International Conference on Human-Agent Interaction (HAI 2016) (2016). Fukuda, M., Huang, H.H., Ohta, N., and Kuwabara, K.: Composing the Atmosphere of a Virtual Classroom with a Group of Student Agents, 16th International Conference on Intelligent Virtual Agents (IVA 2016) (2016). Kuwabara, K., Iwamae, T., Wada, Y., Huang, H.H., and Takenaka, K.: Toward a Conversation Partner Agent for People with Aphasia: Assisting Word Retrieval, 8th KES International Conference on Intelligent Decision Technologies (KES-IDT 2016) - Part I, pp. 203-213 (2016). Kurita, D., Roengsamut, B., Kuwabara, K., and Huang, H.H. 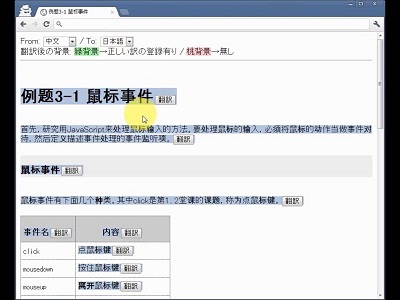 : Knowledge Base Refinement with Gamified Crowdsourcing, 8th Asian Conference on Intelligent Information and Database Systems (ACIIDS 2016), Part I, LNAI 9621, pp. 33-42 (2016). 張 琪, 木村 清也, 黄 宏軒, 岡田 将吾, 林 佑樹, 高瀬 裕, 中野 有紀子, 大田 直樹, 桑原 和宏: グループディスカッションにおける参加者役割とコミュニケーション能力印象評価の関連性分析, HAIシンポジウム 2016 (2016). 福田 匡人, 冠野 哲也, 黄 宏軒, 桑原 和宏: 仮想学級による教員採用試験のための場面指導練習システムの開発, 第30回人工知能学会全国大会 (2016). 岩前 貴之, 和田 侑大, 桑原 和宏, 黄 宏軒, 竹中 啓介: 失語のある人に対する単語想起手法の提案, 第60回システム制御情報学会研究発表講演会 (SCI’16) (2016). 和田 侑大, 岩前 貴之, 桑原 和宏, 黄 宏軒, 竹中 啓介: 失語のある人を対象にした単語想起支援システムの提案, 第42回日本コミュニケーション障害学会学術講演会 (2016). Roengsamut, B., Kuwabara, K., and Huang, H.H. : Toward Gamification of Knowledge Base Construction, 2015 International Symposium on INnovations in Intelligent SysTems and Applications (INISTA 2015), pp. 20-26 (2015). Roengsamut, B. and Kuwabara, K.: Interactive Refinement of Linked Data: Toward a Crowdsourcing Approach, 7th Asian Conference on Intelligent Information and Database Systems (ACIIDS 2015), Part I, LNAI 9011, pp. 3-12 (2015). 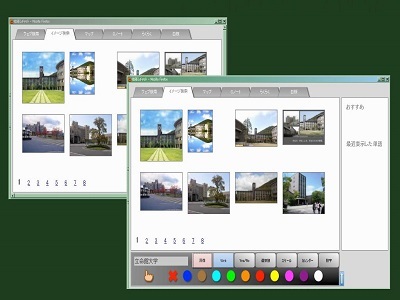 Kuwabara, K. and Roengsamut, B.: Content Co-creation and Refinement for Microlearning Settings, The Seventh International Conference on Mobile, Hybrid, and On-line Learning (eLmL 2015), pp. 44-47 (2015). 田 野, 竹田 勇馬, 黄 宏軒, 桑原 和宏, 川越 恭二: 高齢者の生活状況に基づいたエージェントの発話要約手法の検討, ヒューマンインタフェースシンポジウム (2015). Ohta, N. and Kuwabara, K.: An Integer Programming Approach for Two-Sided Matching with Indifferences, Proc. 6th International Conference on Computational Collective Intelligence (ICCCI 2014), LNAI 8733, pp. 563-572 (2014). Saito, Y., Roengsamut, B., and Kuwabara, K.: Incremental Refinement of Linked Data: Ontology-Based Approach, 6th Asian Conference on Intelligent Information and Database Systems (ACIIDS 2014), Part I, LNAI 8397, pp. 133-142 (2014). 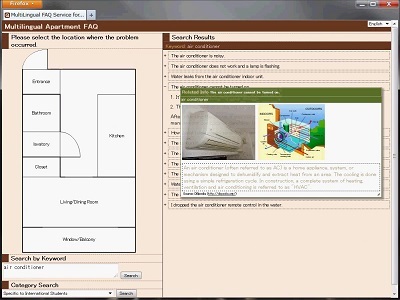 Homan, T., Morita, M., Yamaguchi, Y., and Kuwabara, K.: Construction of a Topic Database for Remote Conversation Support, International Journal of Software Science and Computational Intelligence, Vol. 5, No. 2, pp. 77-91 (2013). Maeda, R., Ohta, N., and Kuwabara, K.: MapReduce-Based Implementation of a Rule System, in Badica, A., Trawinski, B., and Nguyen, N. T. eds., Recent Developments in Computational Collective Intelligence, Studies in Computational Intelligence Volume 513, pp. 197-206, Springer International Publishing (2013). Kinomura, S. and Kuwabara, K.: Developing a Multilingual Application Using Linked Data: A Case Study, Proc. 5th International Conference on Computational Collective Intelligence (ICCCI 2013), LNAI 8083, pp. 120-129 (2013). Yasuda, K., Kuwahara, N., Kuwabara, K., Morimoto, K., and Tetsutani, N.: Daily Assistance for Individuals With Dementia via Videophone, American Journal of Alzheimer's Disease and Other Dementias, Vol. 28, No. 5, pp. 508-516 (2013). Morita, M. and Kuwabara, K.: Agent-based Customization of a Remote Conversation Support System, Intelligent Decision Technologies, Vol. 7, No. 3, pp. 175-184 (2013). Aye, N., Khin, H. S., Win, T. T., KoKo, T., Than, M. Z., Hattori, F., and Kuwabara, K.: Multi-domain Public Key Infrastructure for Information Security with Use of a Multi-Agent System, 5th Asian Conference on Intelligent Information and Database Systems (ACIIDS 2013), Part I, LNAI 7802, pp. 365-374 (2013). 斉藤 祐介, 木野村 晋吾, 桑原 和宏: チャットシステムを活用した留学生支援, 電子情報通信学会2013年総合大会情報・システムソサイエティ特別企画「学生ポスターセッション」, ISS-P-264 (2013). Kuwabara, K. and Kinomura, S.: Mediating Accesses to Multiple Information Sources in a Multi-lingual Application, Proc. 4th International Conference on Computational Collective Intelligence (ICCCI 2012), Part I, LNAI 7653, pp. 326–334 (2012). Ohta, N., Iwamoto, K., and Kuwabara, K.: Changeable Two-Sided Matching for Changing Environment, Proc. 11th IEEE International Conference on Cognitive Informatics and Cognitive Computing (ICCI*CC), pp. 174-177 (2012). Homan, T., Morita, M., Yamaguchi, Y., and Kuwabara, K.: Topic Database for Conversation Support: Its Application and Access Control, Proc. 11th IEEE International Conference on Cognitive Informatics and Cognitive Computing (ICCI*CC), pp. 240-245 (2012). 寶満 亨, 森田 匡哉, 山口 悠, 桑原 和宏: 会話支援のための話題データベースの構築, ヒューマンインタフェース学会研究報告集, Vol. 14, No. 2, pp. 39-46 (2012). 山口 悠, 寶満 亨, 桑原 和宏: 話題データベースにおけるメタデータを活用したアクセス権限の段階的編集, 電子情報通信学会2012年総合大会情報・システムソサイエティ特別企画「学生ポスターセッション」, ISS-P-150 (2012). 木野村 晋吾, 北川 大輔, 桑原 和宏: 多言語知識源の連携による留学生支援システムの提案, 第74回情報処理学会全国大会, pp. 1-557 - 1-558 (2012). Kuwabara, K. and Yasunaga, S.: Use of Metadata for Access Control and Version Management in RDF Database, Knowledge-Based and Intelligent Information and Engineering Systems (KES-2011), LNAI 6881, pp. 326-336 (2011). 大田 直樹, 岩本 健児, 桑原 和宏: 動的環境における Two Side Matching について, 合同エージェントワークショップ＆シンポジウム2011 (JAWS2011) (2011). 森田 匡哉, 寶満 亨, 桑原 和宏: 遠隔会話支援システム「指差しチャット」のガジェットを用いた機能拡張, ヒューマンインタフェース学会研究報告集, Vol. 13, No. 2, pp. 7-12 (2011). 寶満 亨, 森田 匡哉, 桑原 和宏: Web資源を用いた失語症者向け話題データベースの拡張, 電子情報通信学会2011年総合大会情報・システムソサイエティ特別企画「学生ポスターセッション」, ISS-P-233 (2011). 村上 知弘, 油井 貴之, 桑原 和宏: 多言語対訳用語集における付加情報の活用, 第73回情報処理学会全国大会, pp.1-609 - 1-610 (2011). Hattori, F., Kuwabara, K., Kuwahara, N., Abe, S., and Yasuda, K.: Socialware for People with Cognitive Disabilities, in Wang, Y., Zhang, D., and Kinsner, W. Eds., Advances in Cognitive Informatics and Cognitive Computing Vol. 323, Studies in Computational Intelligence, pp. 193-207, Springer (2010). Aye, N., Hattori, F., and Kuwabara, K.: Bridging the Semantic Gap in Distant Communication: Providing Complementary Knowledge within a Context, International Journal of Intelligent Information and Database Systems, Vol. 4, No. 3, pp. 195-211 (2010). 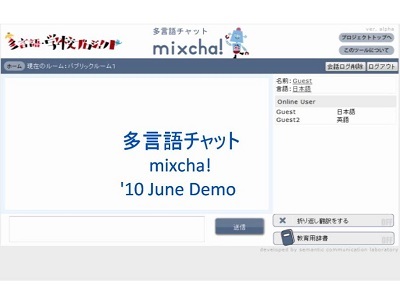 Nakatsuka, M., Yasunaga, S., and Kuwabara, K.: Extending a Multilingual Chat Application: Towards Collaborative Language Resource Building, Proc. 9th IEEE Int. Conf. on Cognitive Informatics (ICCI '10), pp. 137-142 (2010). Kuwabara, K., Shimode, Y., and Miyamoto, S.: Agent-Based Remote Conversation Support for People with Aphasia, KES-AMSTA 2010, Part I, LNAI 6070, pp. 371-380 (2010). Yasunaga, S., Nakatsuka, M., and Kuwabara, K.: Web Ontology Building System for Novice Users: A Step-by-Step Approach, The 2nd Asian Conference on Intelligent Information and Database Systems (ACIIDS 2010), Part II, LNAI 5991, pp. 134-143 (2010). Aye, N., Itoh, T., Hattori, F., Kuwabara, K., and Yasuda, K.: Remote Conversation Support for People with Aphasia, International Journal of Software Science and Computational Intelligence, Vol. 2, No. 1, (Special Issue: Symbiotic Computing) pp. 72-85 (2010). 安永 章太郎, 中司 光紀, 桑原 和宏: 段階的なオントロジー構築支援とその応用, 信学技報 AI2010-22, pp.1-6 (2010). 下出 裕也, 宮本 翔平, 寳満 亨, 桑原 和宏: 失語症者向け遠隔会話支援システム「指差しチャット」の構築, ヒューマンインタフェース学会研究報告集, Vol. 12, No. 2, pp. 7-14 (2010). 中司 光紀, 桑原 和宏: 多言語チャットにおける対訳辞書収集手法の提案, 電子情報通信学会2010年総合大会 情報システム講演論文集1, p.48 (2010). 中司 光紀, 島井 春香, 桑原 和宏: 漢字かな交じり変換サービスの構築, 電子情報通信学会2010年総合大会情報・システムソサイエティ特別企画「学生ポスターセッション」, p. 129 (2010). 下出 裕也, 宮本 翔平, 桑原 和宏: 失語症者向け遠隔会話支援ツール「指差しチャット」における会話支援制御モデルの提案, 第72回情報処理学会全国大会, pp. 2-755 - 2-756 (2010). Yasuda, K., Kuwabara, K., Kuwahara, N., Abe, S., and Tetsutani, N.: Effectiveness of personalised reminiscence photo videos for individuals with dementia, Neuropsychological Rehabilitation, Vol. 19, No. 4, pp. 603-619 (2009). Yasunaga, S. and Kuwabara, K.: Information Retrieval from Multiple Regional Bulletin Boards using Semantic Web Technology, Proceedings of the Second Asian Joint Workshop on Information Technologies (Joint Workshop of Ritsumeikan University and Dalian University of Technology), p.54 (2009) (poster session). Kuwabara, K., Hayashi, S., Uesato, T., Umadome, K., and Takenaka, K.: Remote Conversation Support for People with Aphasia: Some Experiments and Lessons Learned, Stephanidis, C. ed., Universal Access in Human-Computer Interaction. Addressing Diversity, LNCS 5614, pp. 375-384, Springer (2009). 宮本 翔平, 下出 裕也, 桑原 和宏: Web ページの注目点共有による遠隔会話支援ツール「指差しチャット」の提案, 第71回情報処理学会全国大会, pp.4-87 - 4-88 (2009). Aye, N., Hattori, F. and Kuwabara, K.: Use of Ontologies for Bridging Semantic Gaps in Distant Communication, 5th International Conference on Innovations in Information Technology (Innovations'08) (2008). Aye, N., Ito, T., Hattori, F., Kuwabara, K. and Yasuda, K.: Conversation Support for People with Aphasia in Distant Communication The 7th IEEE International Conference on Cognitive Informatics, pp. 294-299 (2008). Aye, N., Hattori, F., and Kuwabara, K.: Bridging Semantic Gap in Distant Communication: Ontology-Based Approach, Nguyen, N. T., Jo, G. S., Howlett, R. J., and Jain, L. C. eds., Agent and Multi-Agent Systems: Technologies and Applications, Second KES International Symposium, KES-AMSTA 2008, LNAI 4953, pp. 252-260, Springer (2008). 桑原 和宏, 服部 文夫, Aye, N., 伊藤 卓朗: コミュニケーション・ギャップの解消を目指したリアルタイム・コミュニケーション支援, DS-2-3, 電子情報通信学会総合大会 (2008). Hattori, F., Kuwabara, K., Kuwahara, N., Abe, S., and Yasuda, K.: Socialware for People with Disabilities, The 6th IEEE International Conference on Cognitive Informatics, pp. 321-326 (2007). 桑原 教彰, 安部 伸治, 安田 清, 田村 俊世, 桑原 和宏: TV電話とコンテンツ共有を用いた高齢者への遠隔からの対話や回想法を可能とするシステムの実現と評価, ヒューマンインタフェース学会論文誌, Vol. 9, No. 2, pp. 41-52 (2007). 上ノ山 広基, 服部 文夫, 桑原 教彰, 桑原 和宏, 安部 伸治: 介護支援を目的とした写真による移動ナビゲーションシステム, ヒューマンインタフェース学会論文誌, Vol. 9, No. 2, pp. 71-76 (2007). Kuwahara, N., Abe, S., Yasuda, K., and Kuwabara, K.: Networked Reminiscence Therapy for Individuals with Dementia by using Photo and Video Sharing, ASSETS 06: The 8th International ACM SIGACCESS Conference on Computers and Accessibility 2006, pp. 125-132 (2006). Kuwabara, K., Kuwahara, N., Yasuda, K., and Abe, S.: Semantic Web Enabled User Interaction for Cognitive Prostheses, The 3rd International Semantic Web User Interaction Workshop (poster) (2006).